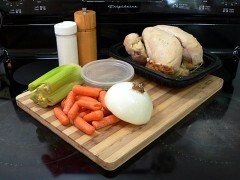 During the summer I love that we can have dinner without heating up the kitchen. 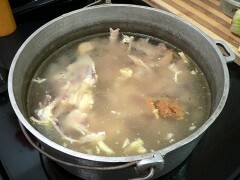 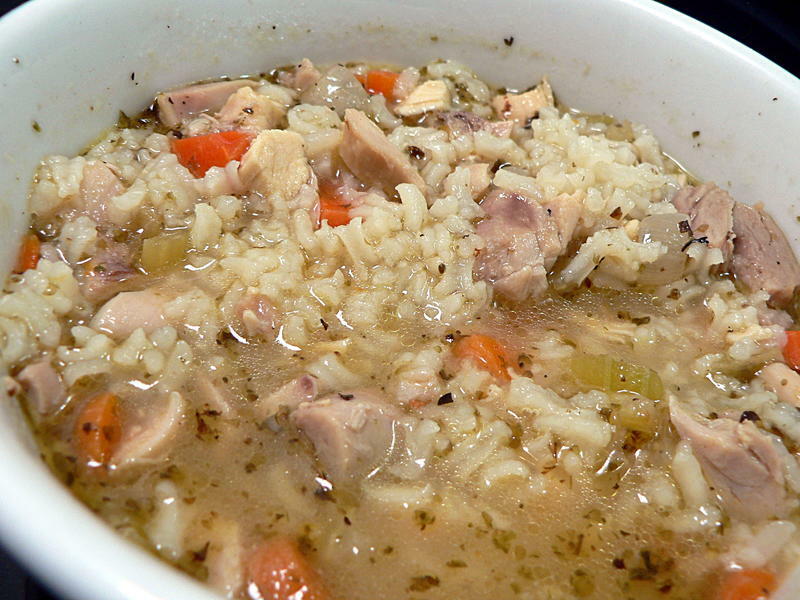 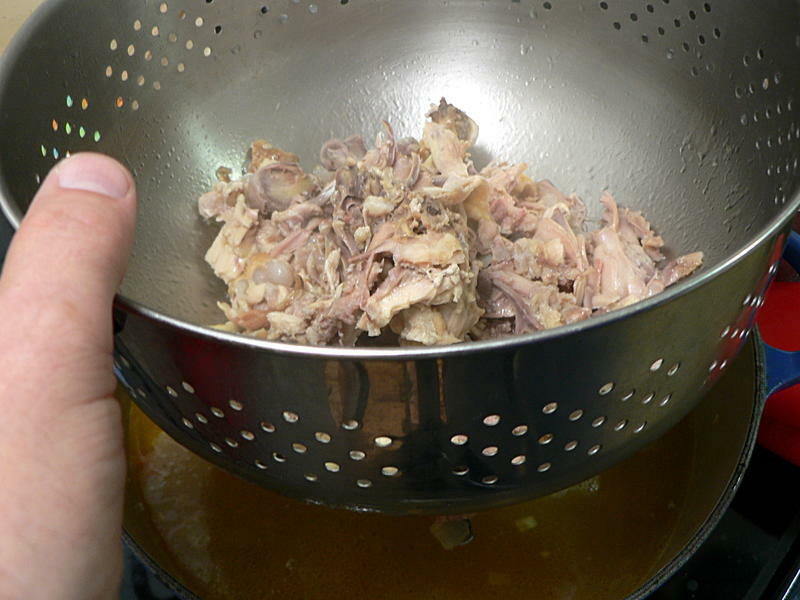 In the fall, I can do chicken soup without having to deal with butchering a raw chicken – which I hate. 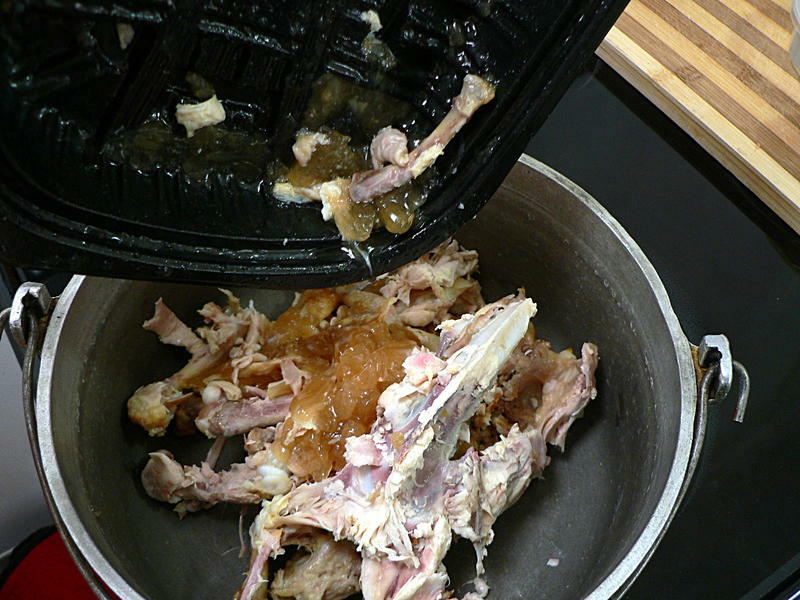 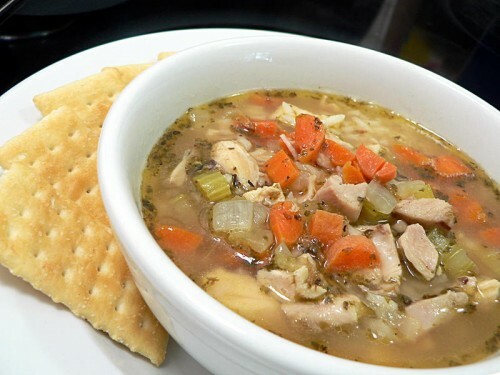 Usually I use leftovers for the soup, but even starting from the whole chicken it only takes about 15 minutes to prep the chicken and another 15 minutes hands-on to put the soup together. 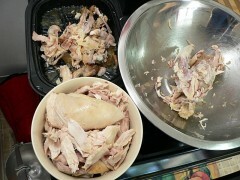 When you’re butchering a raw chicken you need a very sharp knife, probably a cleaver, and a bunch of practice. 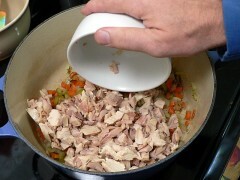 For one that’s already been cooked, just pull it apart by hand. 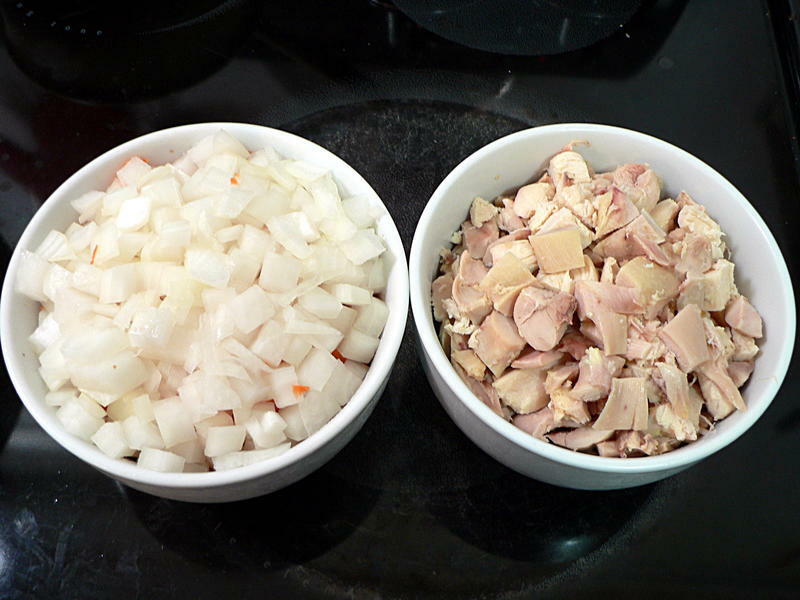 Keep all the meat in one bowl and the scraps in another. 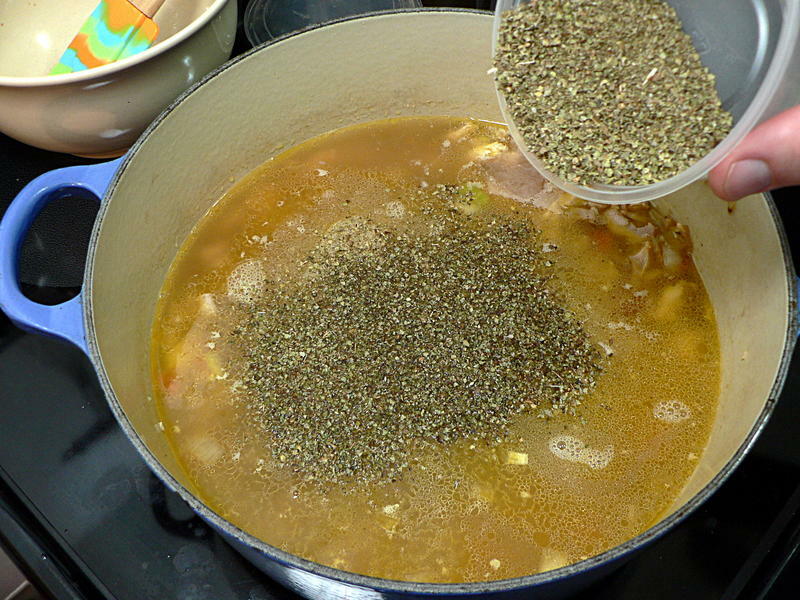 Toss the carcass in a big pot. Add the rest of the scraps and trimmings. 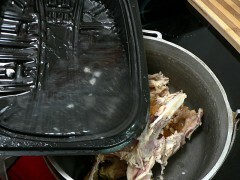 And see that gel in the bottom of the tray the chicken was in? That’s the good stuff. 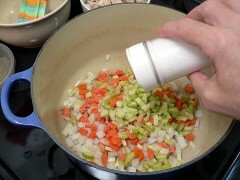 Add that, too. I don’t like to leave any of that behind, so I fill the tray with hot water and swirl it around to get every last bit into the pot. Keep adding water until the carcass is just covered. 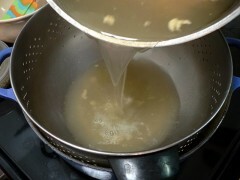 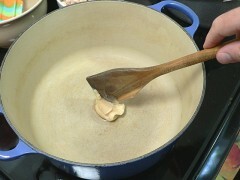 Bring the water to a boil, then turn it down to a gentle simmer, put a lid on it and let it simmer for several hours. 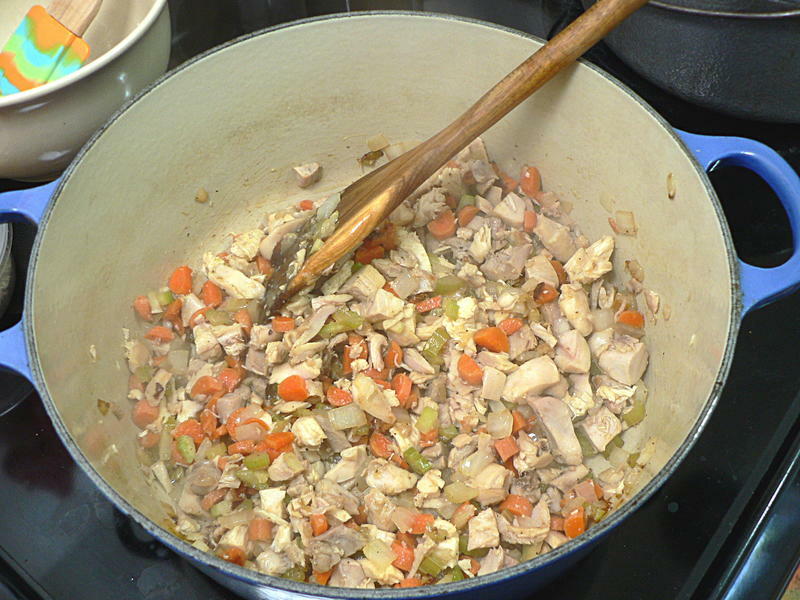 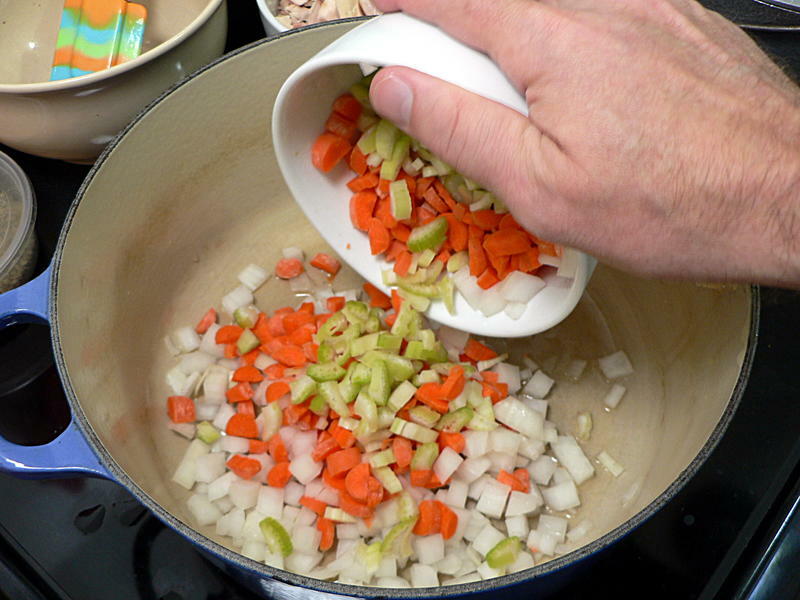 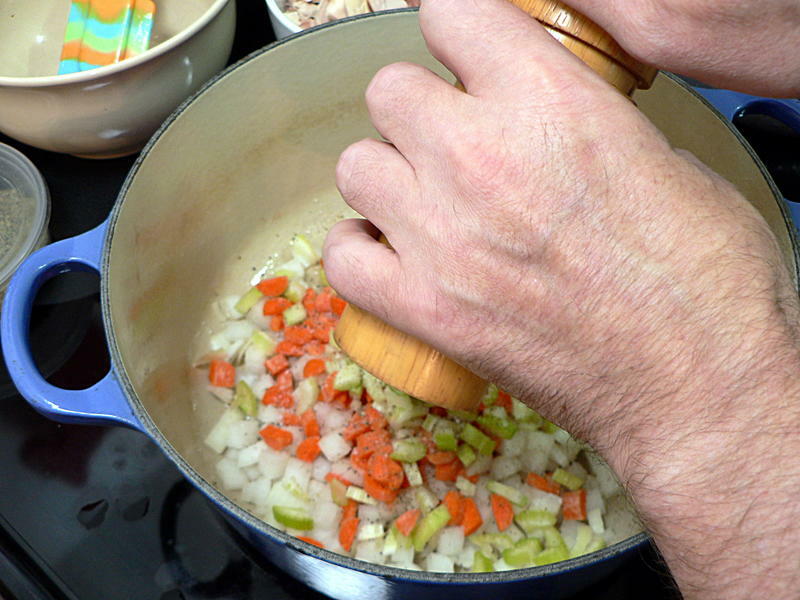 About a half-hour before you want to eat, dice the veggies – by the way, you just made mirepoix – and an equal amount of the chicken. I’m using bacon fat there, but you could just throw in the skin from the chicken and let it render out the fat from that. If someone hasn’t already eaten all the skin off, like someone did to mine. 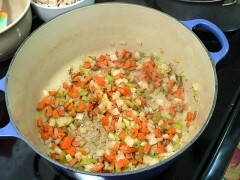 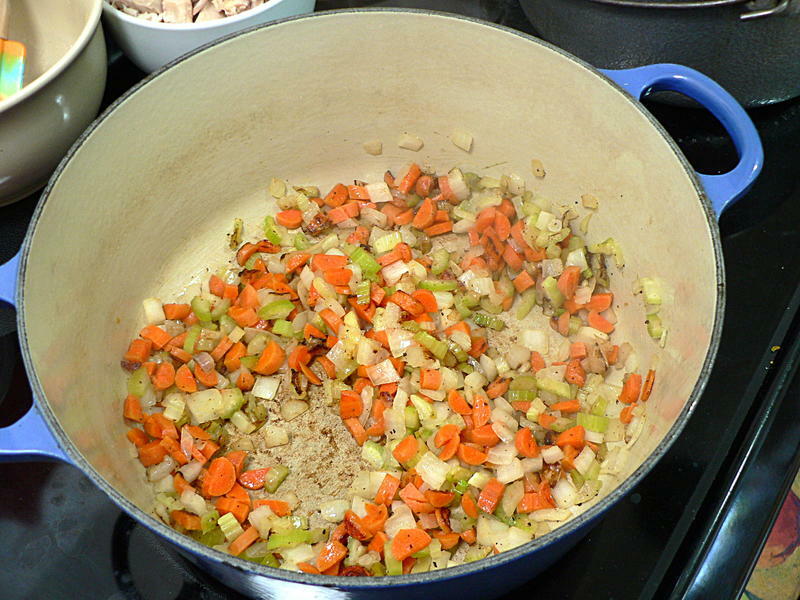 Once the fat is melted, dump in the mirepoix, season with salt and pepper, and sauté until the veggies are all soft. 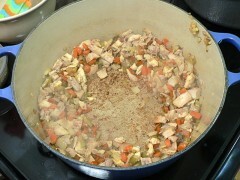 Add the diced chicken and cook until lightly browned. Make some room in the middle of the pot and put a colander right in there. 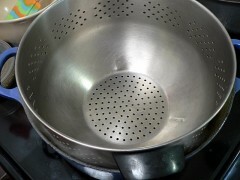 Pour in the contents of the other pot – the one that the trimmings have been simmering in all this time – then lift out the colander. 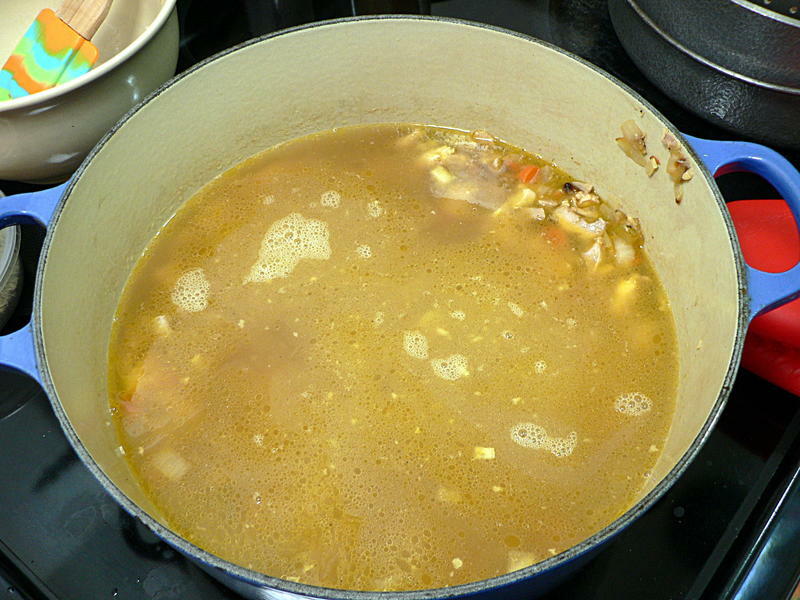 Congratulations, you just made chicken stock. 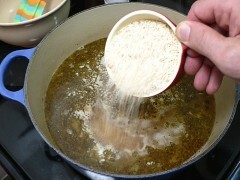 Now add the marjoram – no I didn’t measure it exactly – and the rice. PS: The rice will keep soaking up more and more liquid until there’s almost none left. 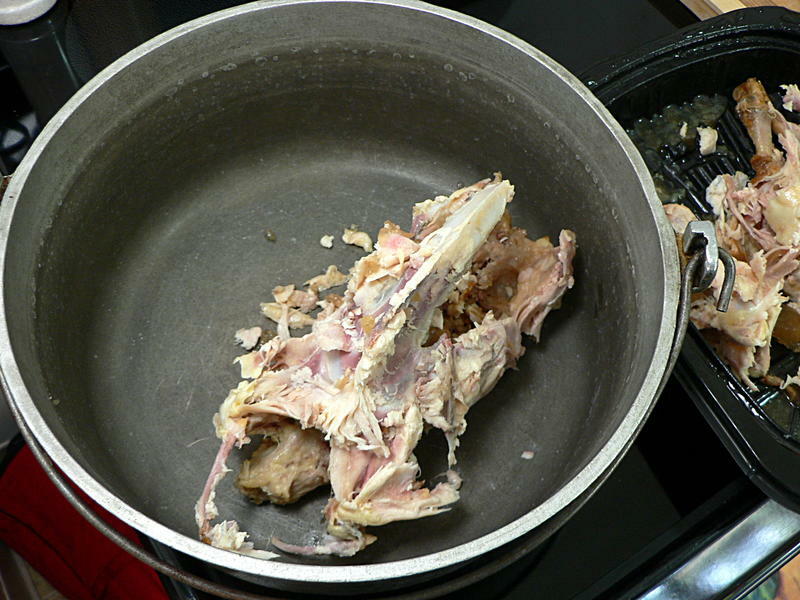 About a half-hour after that picture above was taken, I served up another bowl and it looked like this. The next day when I reheated some leftovers you could eat it with a fork.